We offer Fireman Helmet to our clients. The same is extended to by Civil personnel involved in Fire & Rescue, Traffic Management etc. ‘Concord’ fiber Compliance glass Safety Helmets are just the right helmets for such protection requirements as they provide complete Head protection and are also comfortable to wear. 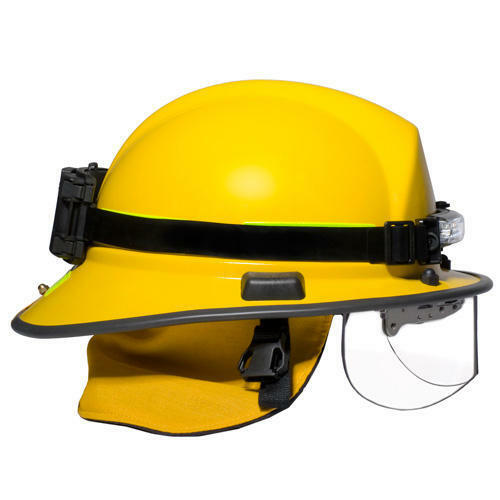 ‘Concord’ Fire men Helmets are made out of Light weight yet tough Fiber reinforced Plastic. The helmets are made up of a combination of Fiberglass and a thermo set resin which keeps the fiberglass fibers in place. FRP Material because of its inherent properties ensures the resistance of Helmet against heat or exposure to Flame. The headband of this model has internal fittings made of cotton / nylon which are adjustable and provided with anti concussion tapes to form a cradle. A chin strap made of cotton / nylon is provided with a buckle for adjustment. They are excellent against heat and also suitable for performance at low temperatures and show resistance to Chemicals etc. Fire and Rescue Teams Civil Defence Personnel Anti Riot Squads Fire and safety personnel of all Industrial segments. Complete Head Protection with comfort of wear. Higher Impact resistance ensures higher Safety. Fibre glass ensures protection from heat and flame exposure. Design ensures ease of wear and more Ergonomic comfort with special structure brim design. Chin strap ensures proper fitment ensuring higher Safety. Comes with adjustable Harness. Certification Compliance ensures dependability of the product.